Announcing their return to the fray through a lambent little 7" of Satie covers, the enduring duo of Antony Ryan and Robin Saville have now finished sketching their long-awaited follow-up to 2004's 'Meet Next Life' - with 'Plans Drawn In Pencil' the charming results. 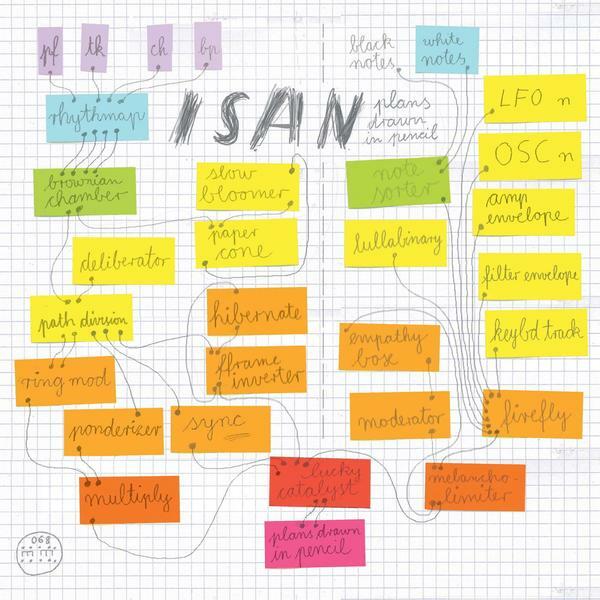 Where Isan were once considered the frothy treat amongst the Morr catalogue, their new album has a considerably darker hue - bringing a piquant bite to the creamy electronica that helped establish their name. Yet for all this talk of malignant undercurrents, 'Plans Drawn In Pencil' is still a a lushly orchestrated treat - with the trademark layered synths and analogue gurgles weaving together to form an undeniably Morrish treat... Opening through the soft-focus murmur of 'Look and Yes', Isan then set about distilling a form of pop-concentrate that's effortlessly filtered through a web of ebbing digitalis - with the likes of 'Road Runner' and 'Five To Four Ten To Eleven' brimming with melodious-hooks and soapy electronics. Describing some of their past work as having fallen into "our trademark one-finger-kiddy-melody sound", the truly epic 'Working In Dust' provides an obvious highlight (and career juxtaposition) on 'Plans Drawn In Pencil' - wherein the Isan boys ditch the schematic of old in favour of a widescreen flash of Krautrock electronica. Far dustier than their polished past, 'Plans Drawn In Pencil' comes across like a smudged sketch-book - and is all the better for it. Gorgeous.